Throttling is a distinctive and controversial feature of Moira. If you are experiencing a delay or any other strange behavior of notifications, chances are, it is because of throttling. Send notification if CPU load on any of your servers is more than 75%. Send notification if there is a fire in your server room. It is a busy day, your servers are overloaded, and you are receiving a ton of notifications about CPU load. Probably, you already have several dozens of notifications in your inbox. You will likely delete all of them at once, and you probably won’t notice that one of these hundreds of letters was about a fire in your server room. If a trigger sends more than 10 notifications per 1 hour, limit this trigger to 1 message per 30 minutes. 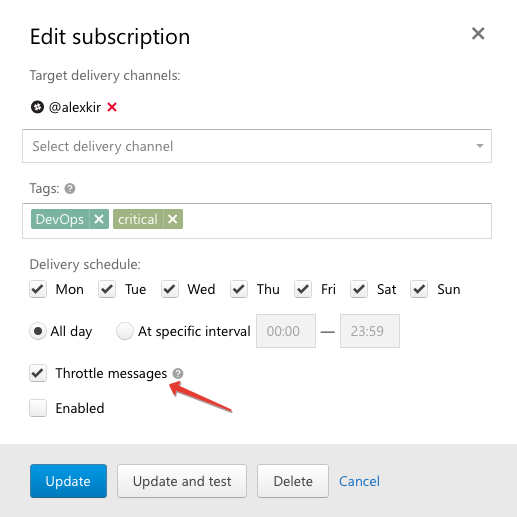 If a trigger sends more than 20 notifications per 3 hours, limit this trigger to 1 message per 1 hour. First notification is delivered immediately. Second notification is delivered immediately. Moira will enable and disable throttling automatically based on frequency of events. Obey the warning message. That is, fix your system to generate less events. Or change trigger thresholds. Or use Graphite functions like movingAverage to remove spikes from your metric graph. This is the best method to deal with throttling.